Making a Splash | Fit Families | Kids VT - small people, big ideas! Most people head to The Essex Resort & Spa for its saunas and steam rooms, manicures and massages. Its expansive treatment list says nothing about underwater tea parties — but there's one happening in a corner of the indoor lap pool on a recent Saturday morning. "Pinkies out," a high-school-aged female reminds four young girls before they dunk underwater. The exercise is part of a swimming lesson, which is not the typical regimented affair parents might remember. 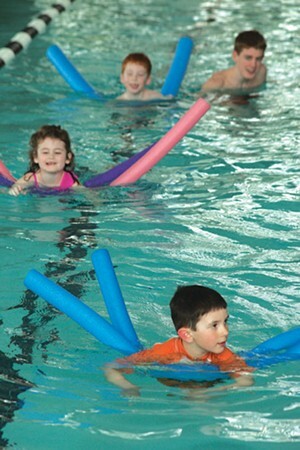 Floating frogs, ducks and balls draw beginners into the water, while noodles and foam backpacks help them navigate the pool. Older swimmers play catch with diving rings and sinking submarines. There's even a designated time to "swim any way you want." 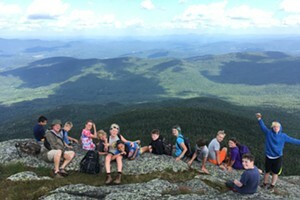 The playful classes are run by the Learning Pool, a nonprofit organization founded in 2009 by Annie Cooper with the mission of developing quality, affordable, public aquatic programs in Vermont. In the Learning Pool's early days, Cooper taught three preschoolers and charged $5 per lesson, which parents would stuff in her shoe while she was in the water. The program has since exploded in popularity. There are 268 students currently enrolled in Learning Pool classes; each is part of a group of four that meets weekly. Many others are on the waiting list. Cooper, who is known among parents as "the Pool Whisperer" and a "swimming guru," has trained 10 instructors to meet the demand. Although she rejects the accolades, Cooper clearly takes pride in teaching kids to swim — a talent she's honed over many years. "It's like breathing for me," she says. Growing up in Brooklyn, Cooper spent every summer weekend at the Catholic Youth Organization pool in Coney Island. By age 12, she was teaching kids to swim — and has been ever since. Keeping kids safe is Cooper's number-one priority. She and most of her staff are Red Cross-certified lifeguards. They're trained to keep their entire group directly in front of them at all times, to teach kids how to jump in the water without landing too close to the edge, and to slow down and regroup when kids get overly excited. But Cooper says swimming instruction often overemphasizes what can go wrong, giving kids negative feelings about jumping in. Her philosophy? If kids have fun in the water, they'll want to come back for more. A look around the pool proves her point. Preschoolers in bright bathing suits and goggles bob happily up and down, buoyed by foam backpacks. A young boy makes his way down a lane with a noodle, and Cooper encourages him by chanting, "You're swimming, you're swimming!" in a sing-songy voice. He smiles proudly. "She has a way with kids that makes them trust her," says Zynnia Seidita, whose daughter, Angelina, has been taking lessons with Cooper since the Learning Pool started. She says Cooper improved Angelina's swimming skills — without pushing the girl out of her comfort zone. Cooper's long-term goal is to raise enough money to build an aquatics center in Essex Junction, which would give many more kids year-round, affordable access to a pool. "Really, swimming is innate," Cooper says. "Given fun and opportunity to be in the water, you will learn how to swim." Know before you go: The Learning Pool lessons last 30 minutes. Parents are welcome to hang out on the sidelines. For more information, visit thelearningpool.org. Where to go: During the school year, six-week sessions for school-age children and preschoolers take place at the Essex Resort & Spa in Essex Junction and PT360 in Williston. The next session begins on April 29. In the summer, the Learning Pool curriculum is used at Maple Street Pool in Essex Junction. Registration for all lessons is through Essex Junction Recreation and Parks. Visit ejrp.org for details. Price: Six lessons cost $60 for residents of Essex Junction and $70 for nonresidents.